I was an early riser this AM....4:15. Where was I headed you ask.. Cave Creek Flea Market!!! 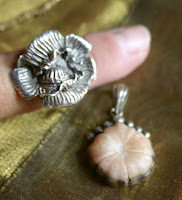 Bought the sterling silver Hollyhock ring and a Pink Rose Marble pendant. It was pretty cool. Met some nice folks and of course bought a few treasures. Cave Creek is so beautiful - brings back the feel of NM but with more cactus. It was sprinkling all morning, but we were all done at the Market when any heavy rain fell. Headed over to an estate sale in the same area before coming home. Funny to walk into a house and see Rose Mofford the X Govenor of Arizona sittin' there. She looked still the same that beehive hairdo and thick fake eyelashes. Bought a couple of items there and even a shovel I'd never seen before for a $1.